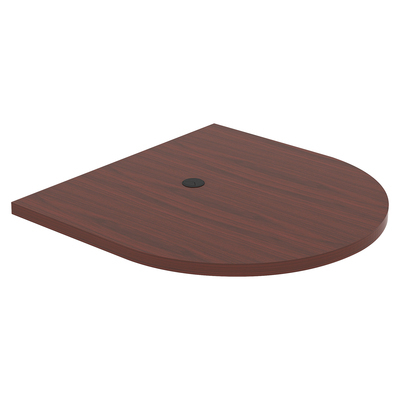 Stylish, Oval Tabletop Is The Top Part Of A Lorell Prominence Infinite Length Conference Table. Attach An Adder Section (Sold Separately) To Expand The Conference Table Or Just A Matching Modesty Panel, Straight End Base And/Or Curved Base (All Sold Separately) To Complete It. Mahogany Melamine Laminate Offers A Durable Surface With A 3mm Edgebanding To Last For Years Of Meetings. High-Pressure Laminate Is Stain-Resistant, Spill-Resistant And Scratch-Resistant. Heavy-Duty, 2" Thick Tabletop Is Made With Melamine-Faced Chipboard And Medium-Density Fiberboard With A 50mm Thick Honeycomb Frame. Use The 3-1/4" Grommet For Easy Cord Management. Weight Capacity Is 80 Lb. (36.5 Kg). To Support This Tabletop, Use Two Bases.. Stylish, Oval Tabletop Is The Top Part Of A Lorell Prominence Infinite Length Conference Table. Attach An Adder Section (Sold Separately) To Expand The Conference Table Or Just A Matching Modesty Panel, Straight End Base And/Or Curved Base (All Sold Separately) To Complete It. Mahogany Melamine Laminate Offers A Durable Surface With A 3mm Edgebanding To Last For Years Of Meetings. High-Pressure Laminate Is Stain-Resistant, Spill-Resistant And Scratch-Resistant. Heavy-Duty, 2" Thick Tabletop Is Made With Melamine-Faced Chipboard And Medium-Density Fiberboard With A 50mm Thick Honeycomb Frame. Use The 3-1/4" Grommet For Easy Cord Management. Weight Capacity Is 80 Lb. (36.5 Kg). To Support This Tabletop, Use Two Bases.